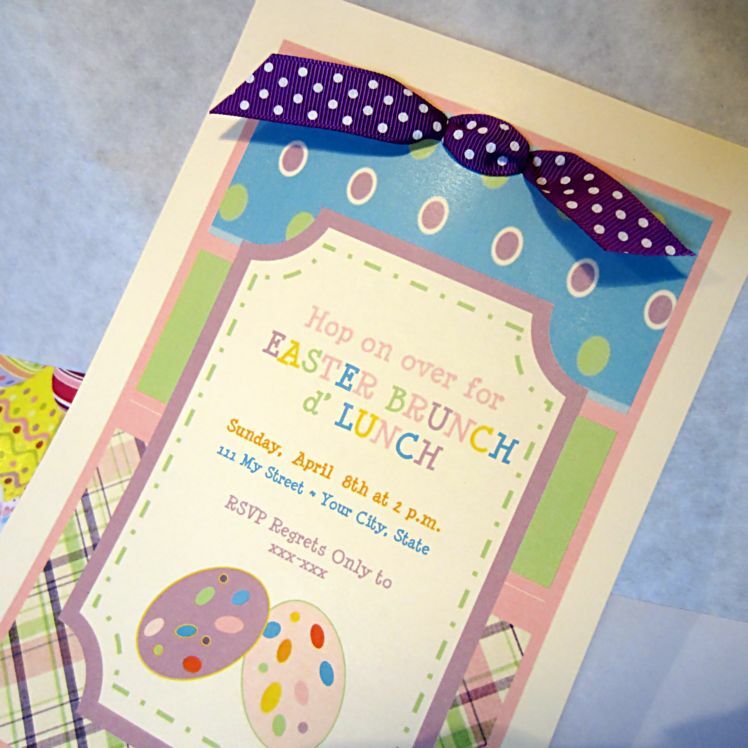 Former blog posts have mentioned I’m hosting an Easter brunch this year. Of course, I want an awesome table display as well as great food. Being the crazy woman I am, I decided to grow wheatgrass for part of my table setting. 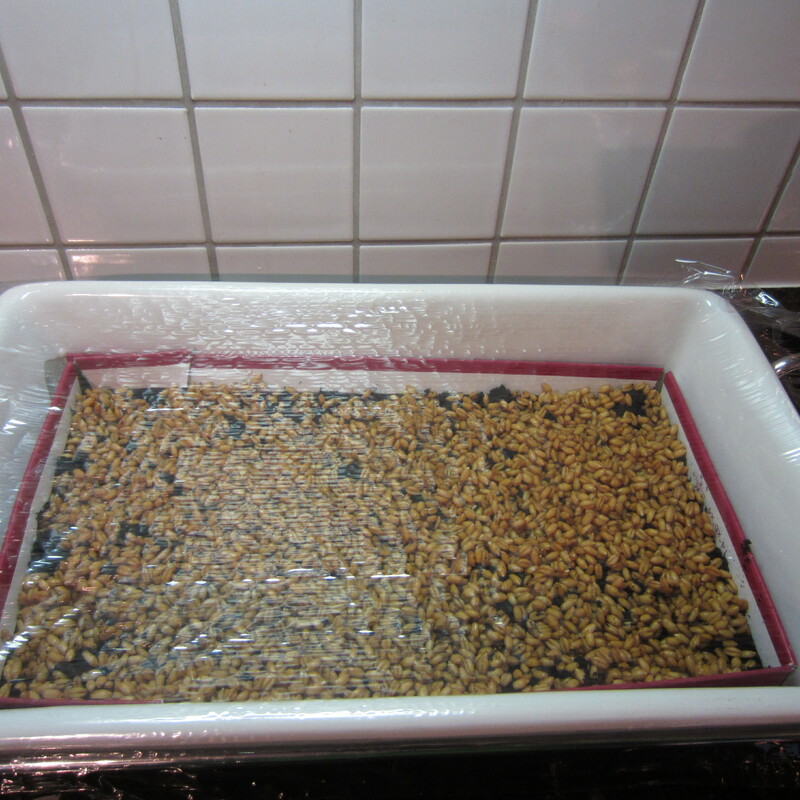 I purchased a pound of organic wheatgrass seeds and soaked them for 8 hours, then drained, then repeated with one more soak. I’m crossing my fingers the seeds sprout after all that soaking (it was what the company recommended for optimal growth). I have a plan formulated for my table setting. I selected a ceramic dish and lined it with the top of a shoebox cut to size. Several layers of moist paper towels line the box top. I then applied a moist layer of peat soil (use a spray water bottle to moisten the peat). 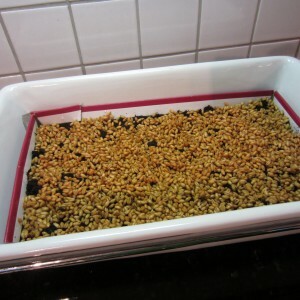 Evenly distribute the soaked wheatgrass seeds into the peat soil. Push down slightly to secure seeds into the soil. 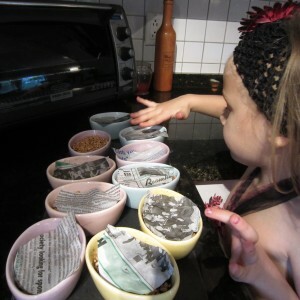 Using the water bottle, lightly spritz the planted seeds. They need to remain moist during their growing session (about 9-10 days). I’m anxious to see if the roots sprout. I covered the dish with plastic wrap to create a greenhouse effect. Wheatgrass does not require direct sunlight to grow which is great for me. I have very few windows in my house. I’m keeping them on a side counter in the kitchen. My granddaughter, Olivia, helped me plant smaller egg shaped containers. 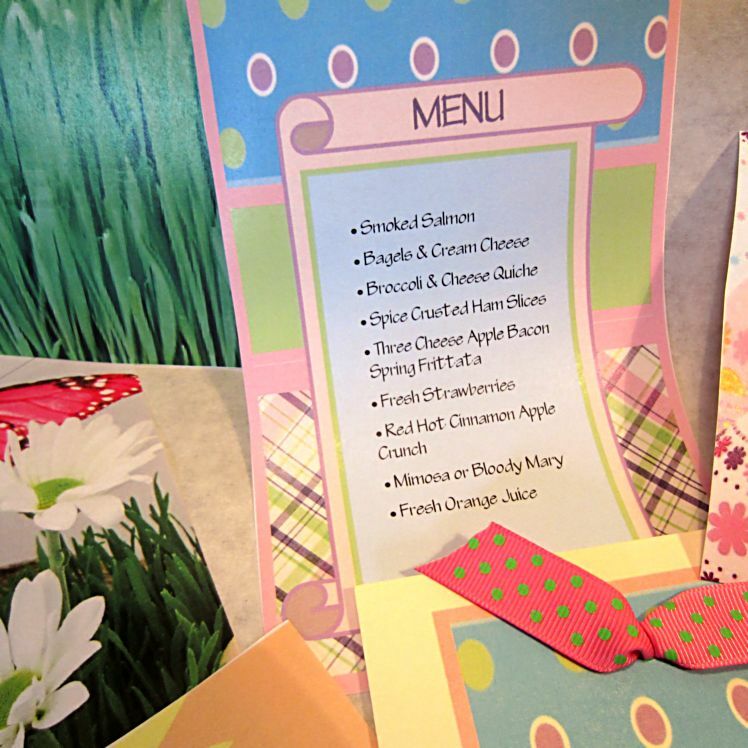 If all goes well, these will be displayed at each table setting along with a colorful egg nestled in the grass. It’s a win/win or lose/lose project. Easter is on the April 8 and I’m a bit behind the estimated growing time. If anyone has cultivated wheatgrass with success, I welcome your input. 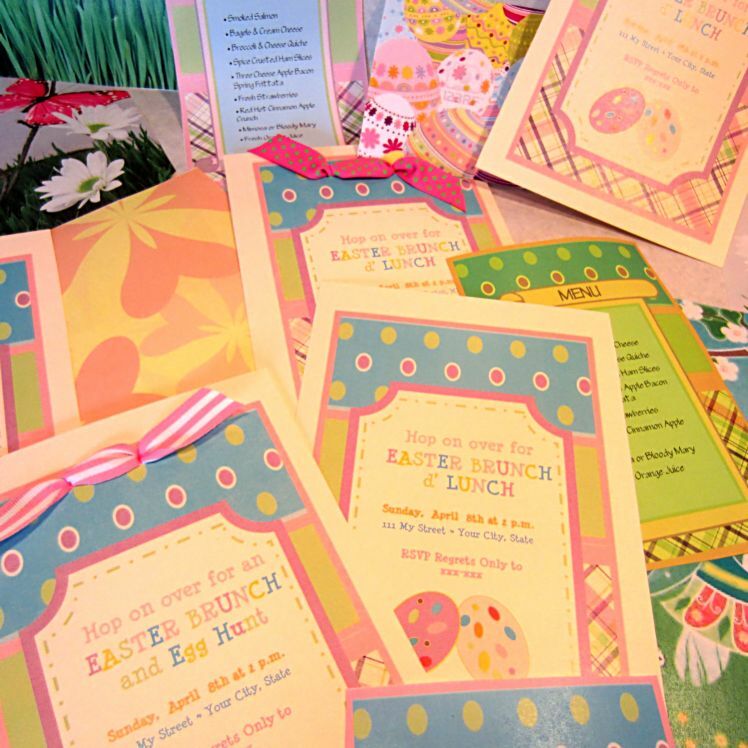 My grand kids are out of state on Easter break this next week. They are excited to see if how much the wheatgrass grows while they are away. I sure hope I don’t disappoint them. I’ll keep you posted on the progress. 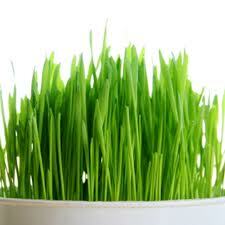 Oh, and for those not familiar with wheatgrass, it’s pictured below. Wheatgrass can also be juiced and drunk. Here is a list of the benefits of wheatgrass juice. This was my 9-year old grandson’s breakfast this morning before a trip to Tennessee to visit his “other” grandparents. Poppy, the wine guy, was in the kitchen at 5 AM to make these special pancakes using the apple crisp the kids made on Thursday. You’ll find the apple crisp recipe here. Pictured are three pancakes, a generous scoop of apple crisp topped with sugar-free applesauce and fat-free whipped cream. A teaspoon of no-sugar maple syrup garnishes the pancake layers. Calories are in the neighborhood of 325 calories. Lose one pancake and save yourself 39 calories. 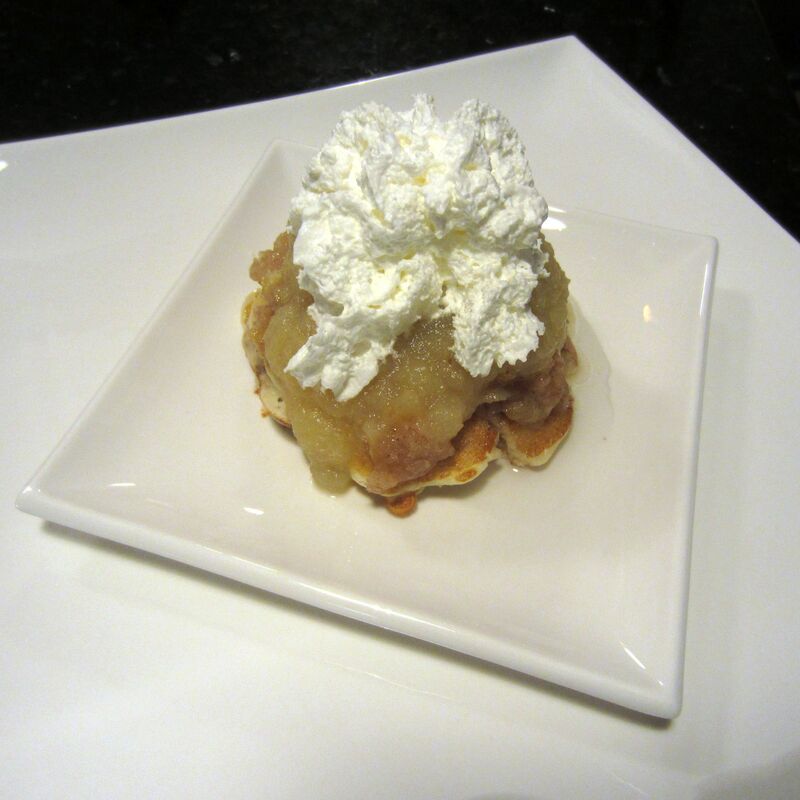 There are two stories behind this apple crisp dish. My grandsons stayed overnight on Thursday. Carson got into a little trouble and was grounded from TV and Wii. Blimpy Girl NeeNee decided we could we could work together in the kitchen. We made an apple crisp (a favorite for Carson). 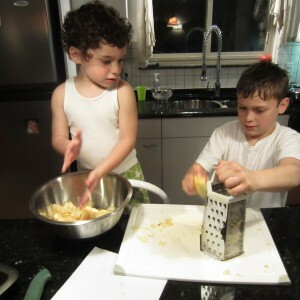 We enjoyed our project and the boys learned something new. 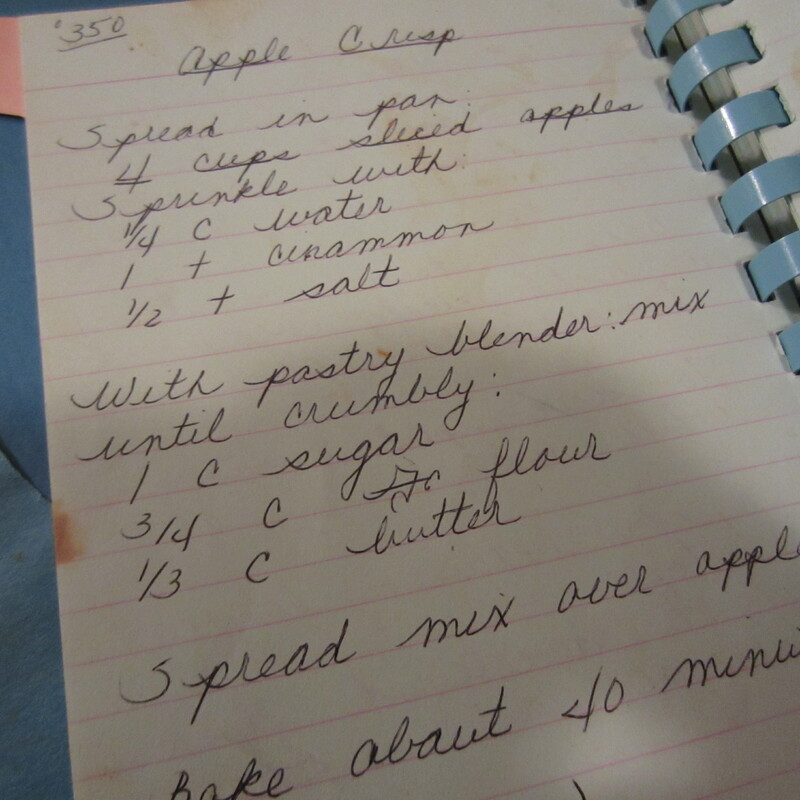 I discovered an apple crisp recipe dating back to the early 1970’s. I’m fairly certain the recipe book was a wedding gift from my first marriage (my daughter’s Dad). My grand son loved that I used this recipe while married to his Poppa. So, with stories shared, here is the recipe (not exactly Blimpy Girl style, but heck… call it a splurge). 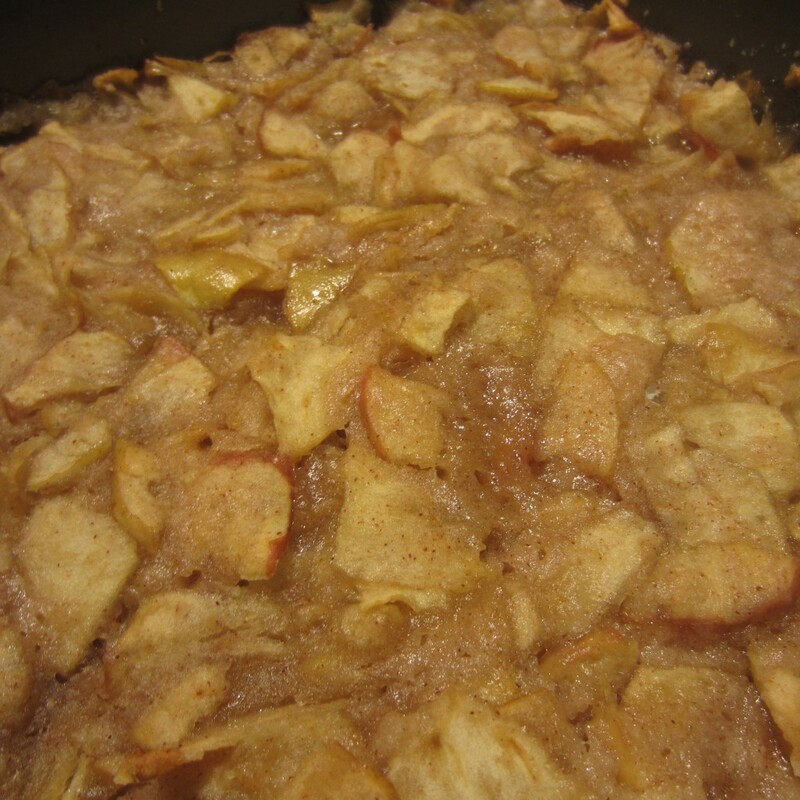 Sprinkle apples with 1/4 cup water, 1 teaspoons cinnamon, and 1/2 teaspoon salt. In a separate bowl add1 cup sugar (I used Splenda), 3/4 cups flour and 1/3 cup butter (whipped-low fat kind). Mix with a pastry blender until crumbly. Spread mixture over the apples. Bake in a 350 degree oven for 35-40 minutes. Serve while warm. Makes 6 servings. Calories… you don’t need to know, it’s a splurge item *wink*. 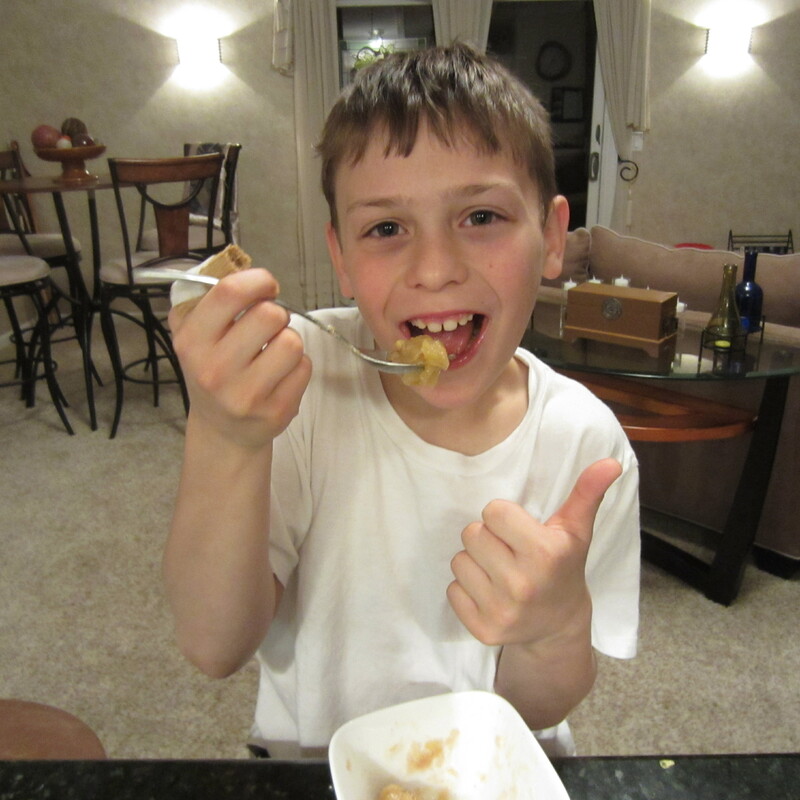 The apple crisp receives a thumbs-up. I ordered new egg shaped dishes for an upcoming Easter brunch. I threw together this egg scramble to pre-test the new dishes. Double cheese WOW is all I can say about this egg scramble. The cool egg dishes were found at Oriental Trading (of course, they are now sold out). I used egg mate substitute because it’s low in calories and cholesterol. Plus, egg mates are packed with protein and potassium. A great way to start the morning. I must admit there is no recipe. I just dug around in the veggie bins of my fridge and pulled out food items I thought would work. After my scavenger hunt, I ended up with the following ingredients. You can adjust to whatever you have on hand. Roasted red skin potatoes (chopped). I used leftover red skins from this Blimpy Girl recipe I prepared earlier in the week. 1 wedge Laughing Cow Swiss cheese (if you don’t want the double cheesiness, cut the wedge in half). 1 tablespoon chopped spinach, pinch of scallions, 1 tablespoon roasted red skin potatoes, pinch of yellow pepper and 1 teaspoon diced tomatoes. Microwave for 45 seconds. Remove from microwave. Add 1/4 cup Egg Mate and Laughing Cow cheese. Season to taste with salt and pepper. Return dish or cup to microwave and heat for an additional 45 seconds. Tip: Spray cups/dishes with non-stick cooking spray before adding ingredients. Here’s the scoop on calories. Surprisingly, this cheezie egg goodness is a mere 70 calories. If using one-half of the Laughing Cow cheese wedge, calorie intake is 50. For me, the extra cheese is a treat. 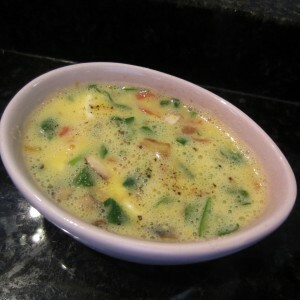 I added two Morning Star soy sausage links (on the side) to this egg scramble. Two links are 80 calories. Packed with flavor and only 76 calories. Serve warm from the oven for lunch or as a hot appetizer. A quick, easy, foolproof recipe you can bake and serve in under 25 minutes. 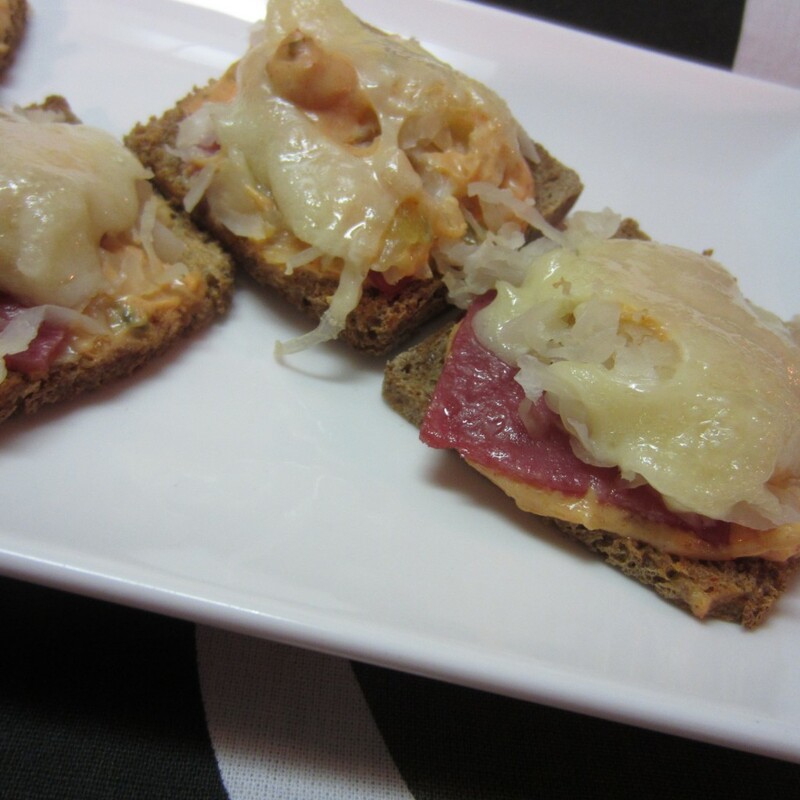 I love-love a hearty Reuben sandwich, but not the high calories. This baby version satisfies that craving. Prep work is minimal and bake time is 8 minutes. My UPS guy did a sample test fresh from the oven with rave reviews. My daughter will be here shortly for her Blimpy Girl lunch pick-up. Anxious for her input since she will have to reheat in the microwave. There’s no oven at her workplace, so preparing in advance wasn’t an option. Thin hard salami rounds, low-fat or lean is even better. I used Eckrich brand found in grocery lunch meat section. 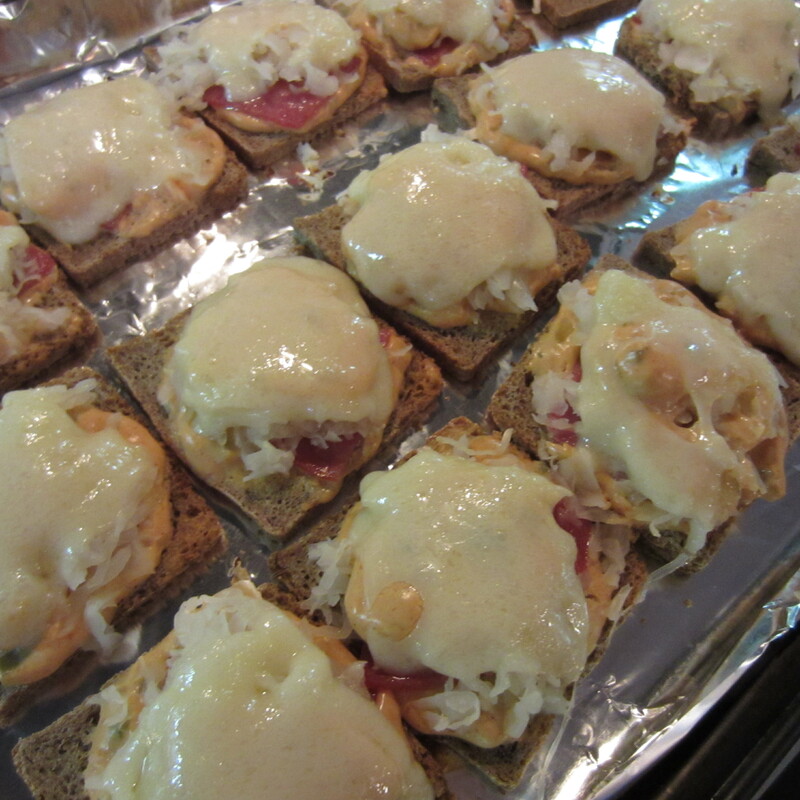 I made 15 baby Reuben sandwiches. 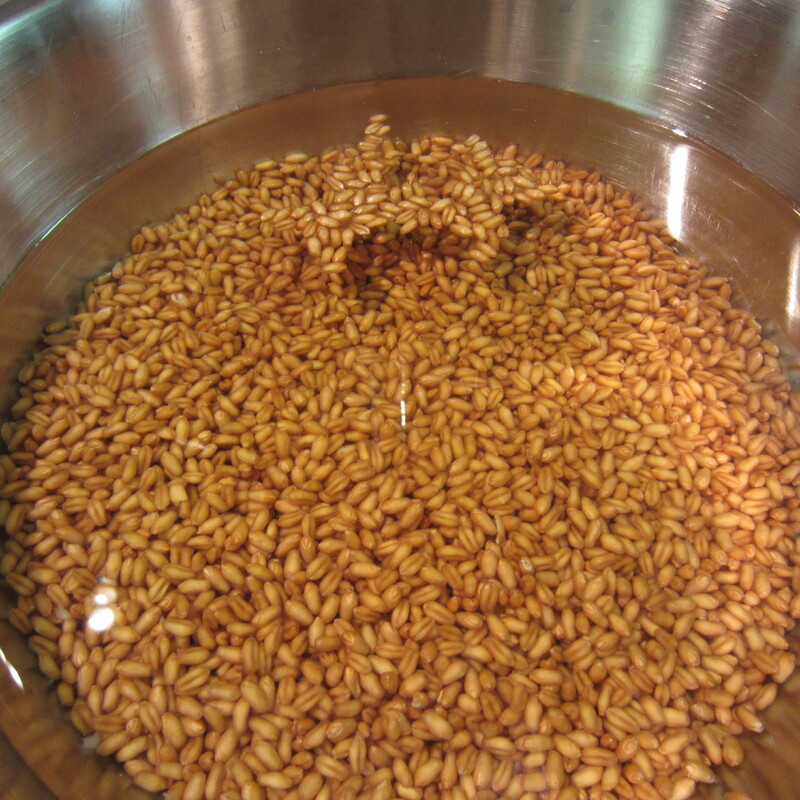 You can prepare the whole loaf of rye bread if you like. Each bread slice requires 1/4 salami slice, 1/4 Swiss cheese slice, 1 1/2 to 2 tablespoons sauerkraut. In a bowl, combine mayonnaise, pickle relish, ketchup, mustard and paprika. Mix well and set aside. 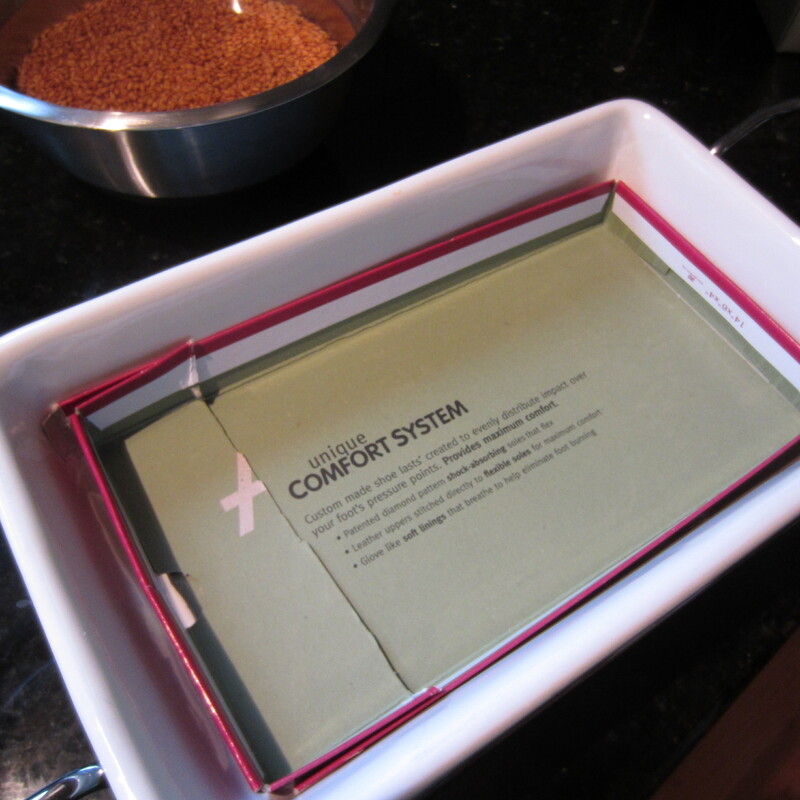 Line a cookie sheet with foil (easier to clean up). 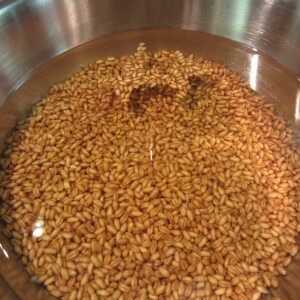 Arrange rye bread pieces in a single layer on sheet. 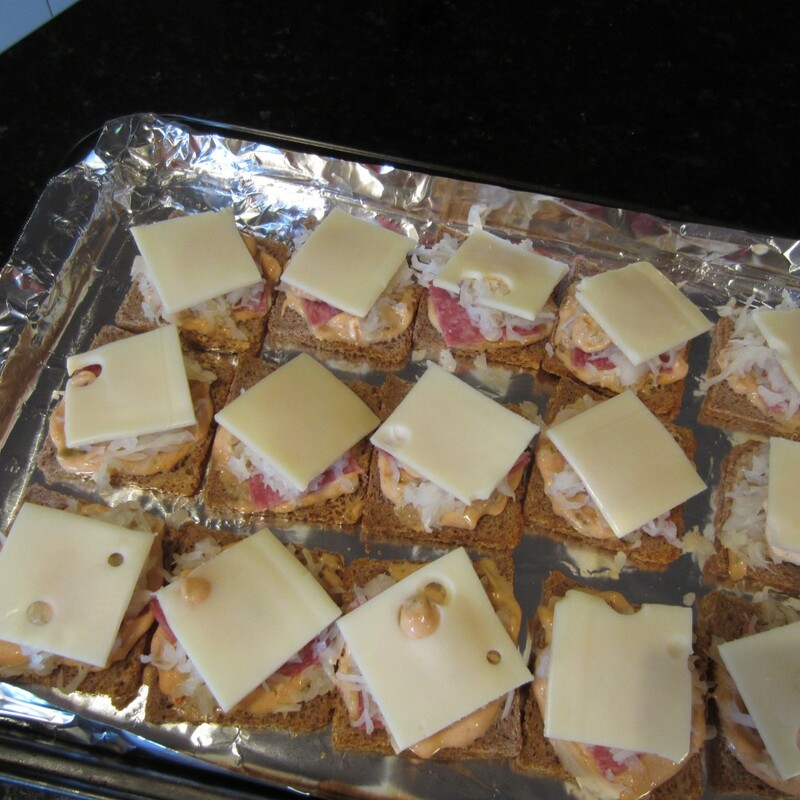 Place and spread a dollop of dressing onto each bread slice. Follow with a piece of salami, then sauerkraut. Finish with another dollop of dressing and Swiss cheese. Bake at 400 degrees for 8 minutes, until cheese melts. Each baby Reuben is in the neighborhood of 76 calories. Pair three of these with a spinach side salad (low fat dressing), and you will still be well under 300 calories. 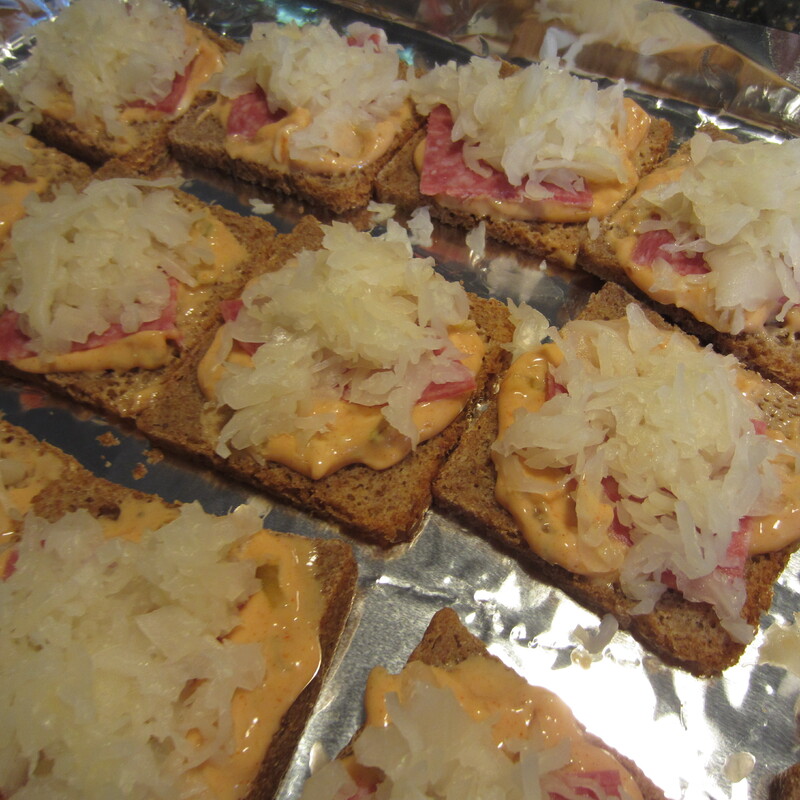 A traditional Reuben (from a deli or restaurant) can range from 600 – 700 calories. This is a hit in my opinion. The best of both in taste and calories. 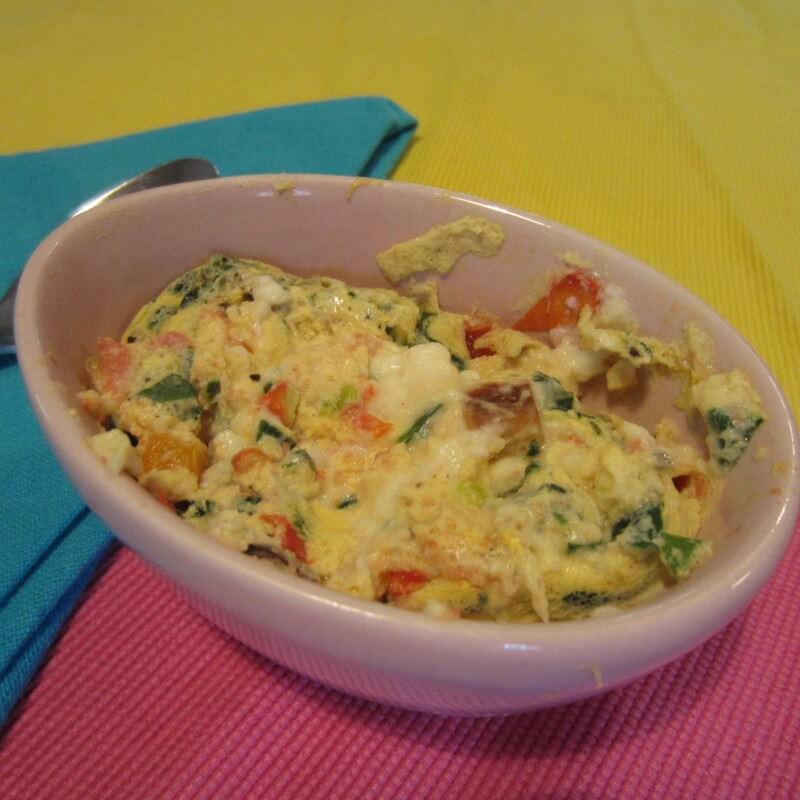 This morning’s blog post was about a Greek Chicken Salsa dish. Well, here’s the follow-up on what to do with any leftover salsa. This is my lunch today. My opinion may be jaded, but is was yum-yum and then some! You will find the Greek Salsa recipe here. 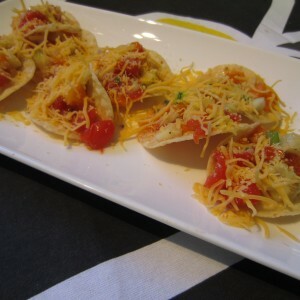 The only additional ingredients needed are baked tortilla chips and low-fat shredded cheddar cheese. Nine of these little guys is around 225 calories. My honey-man, the wine guy, does all the grocery shopping. At least once a month he makes a trip to Costco to stock up on miscellaneous items. Big bags of boneless chicken breast from the freezer section is always on the list. Opening the freezer, I realized I had chicken coming out the wazoo. It was a “no-brainer” what was on the dinner menu. How to prepare it became the bigger question. I do believe this recipe will be a keeper. 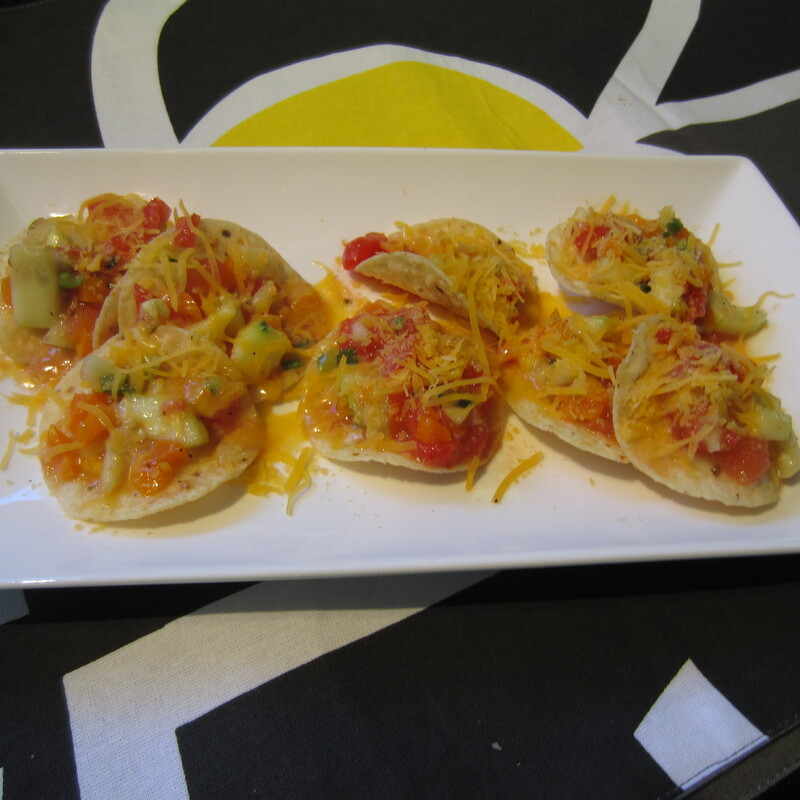 Chicken is cubed and cooked in a lemon marinade and topped with flavorful Greek salsa. 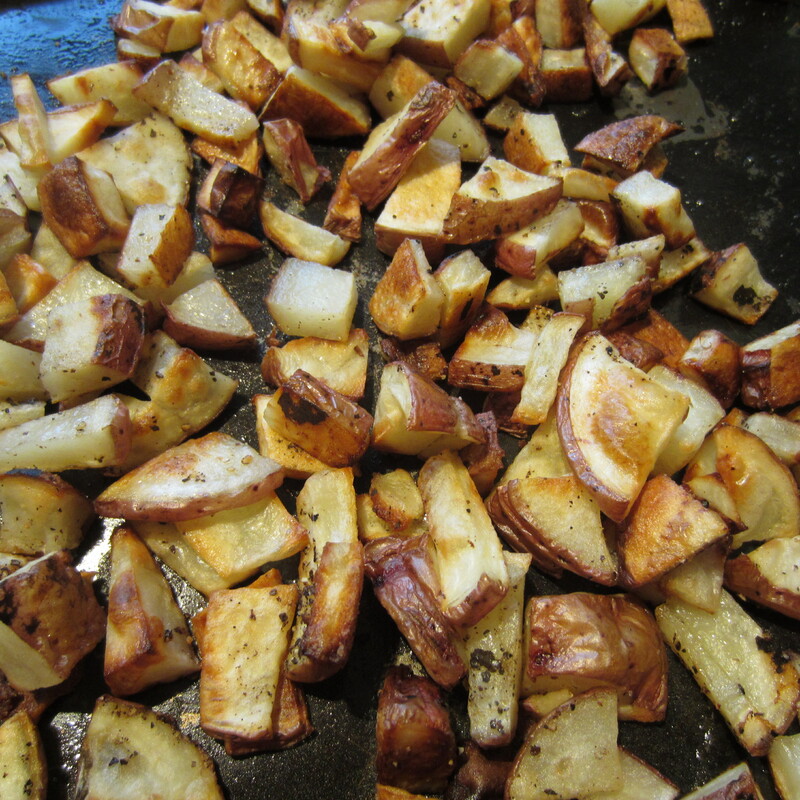 I opted to serve roasted red skin potatoes on the side. One serving (pictured above) is in the neighborhood of 290 calories and I struggled to finish it. This colorful, tasty dish rocks. I’m anxious for my daughter to taste it. She’ll be stopping by this morning for her usual cup of dark roasted java and a Blimpy Girl lunch. 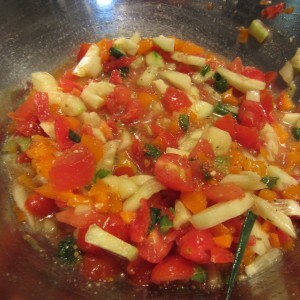 Tomato, cucumber, bell pepper, scallions…. 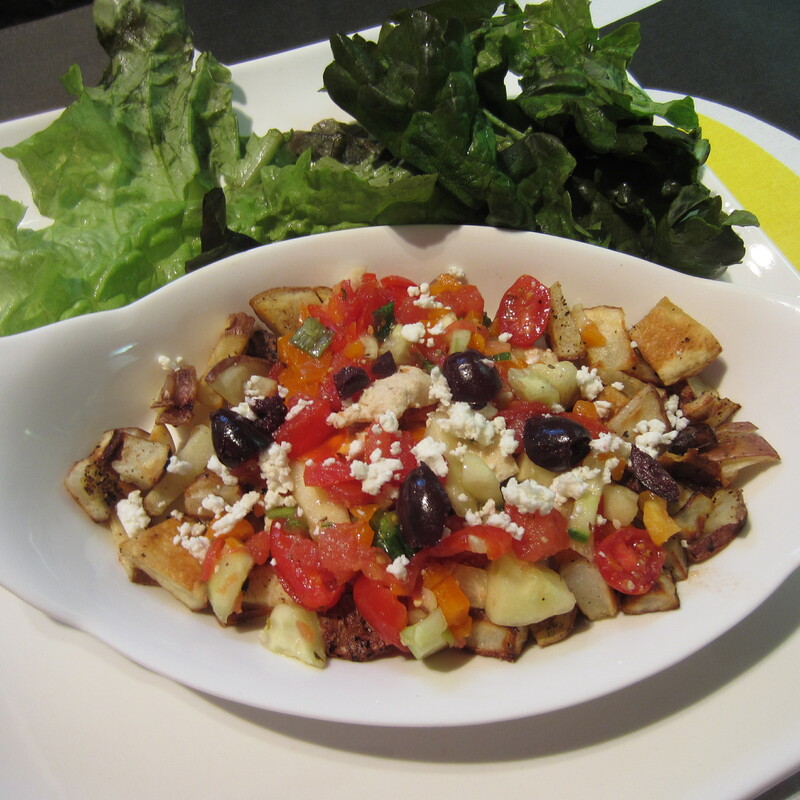 oh, did I mention low-fat feta and a few chopped Kalamata olives? These low-fat veggies are then bathed in a lite Caesar dressing. I admit to it, I claim ownership and make no apologies. I’m on a eggplant kick. I’ve had a surplus of the purple people hanging out in my kitchen calling out, “rescue me, rescue me from the silver mouth trash can”. Throwing out neglected veggies seems shameful. Hence…the recent surge in eggplant recipes. The inspiration for this sandwich is unknown. Maybe the cooking fairy paid me a visit in a dream. Heck, most of the time, I just peek in cupboards and scrounge around in the fridge seeking out food stuff needing immediate attention. It’s kind of a “fly by the seat of your pants” cooking style. Wowie, seems like a long ingredient list. I’m guessing you’ll find most of this stuff hiding out in the pantry or fridge. 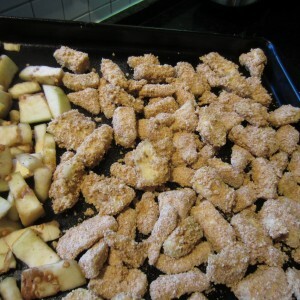 Place bread crumbs, flour, cubed eggplant and egg mixture into separate bowls. 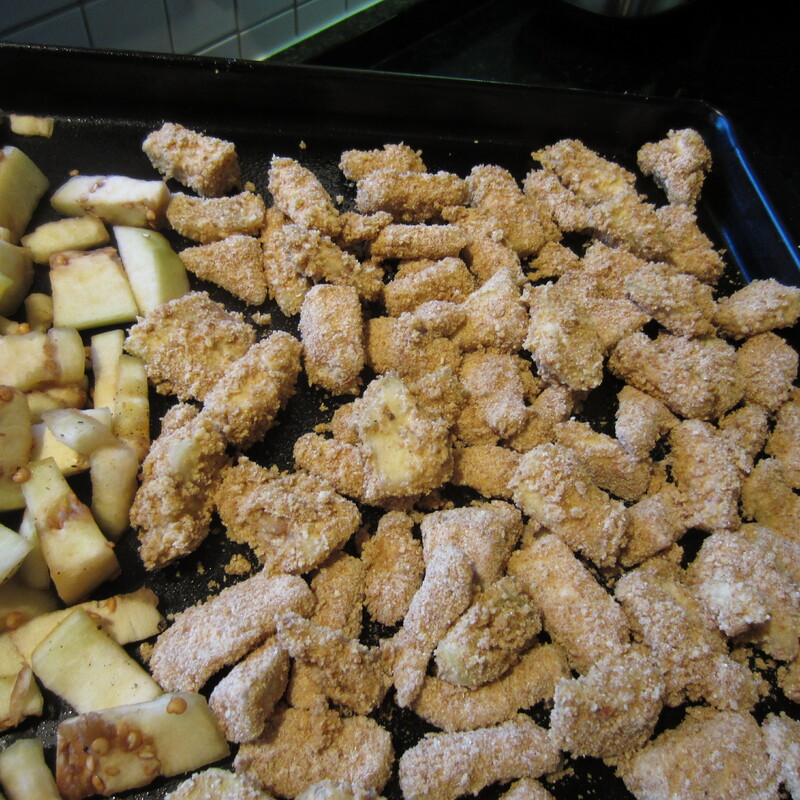 Dip the eggplant cubes in flour, then coat with egg mixture and roll in bread crumbs. Place eggplant pieces on a cookie sheet sprayed with non-stick cooking oil. Bake in 425 degree oven for 30 minutes. Mix yogurt, mayonnaise, parsley, oregano, vinegar and olive oil. Add salt and pepper to taste. Place in fridge until ready to serve. Remove cooked eggplant from oven. Allow to cool. Cut each pita round in half. 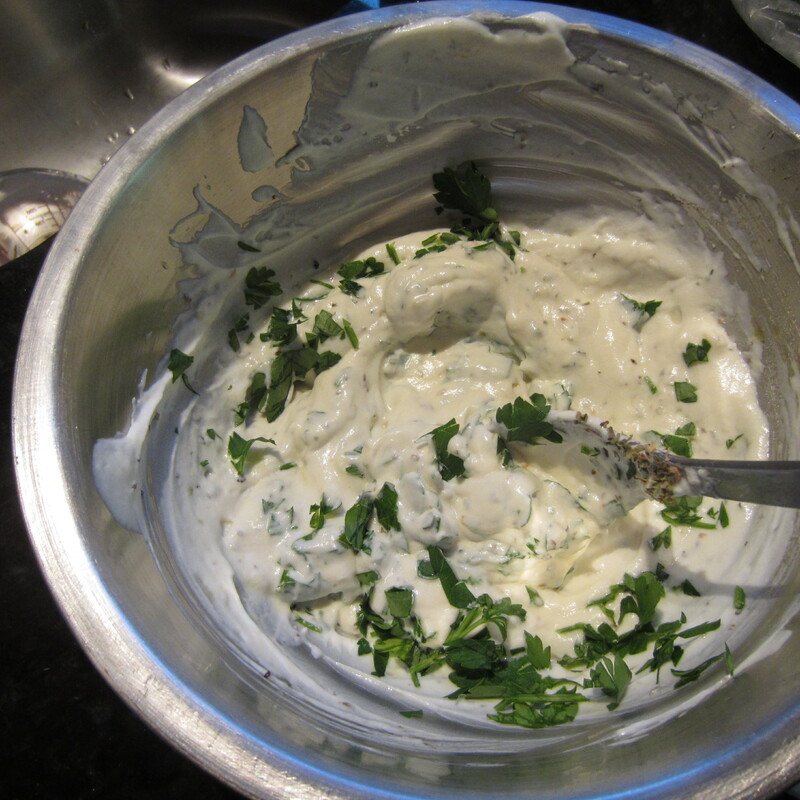 Stuff each half equally with eggplant, cucumber, tomato, red pepper, feta cheese and yogurt sauce. Plate the gyro on a romaine lettuce. This recipe will easily serve five. 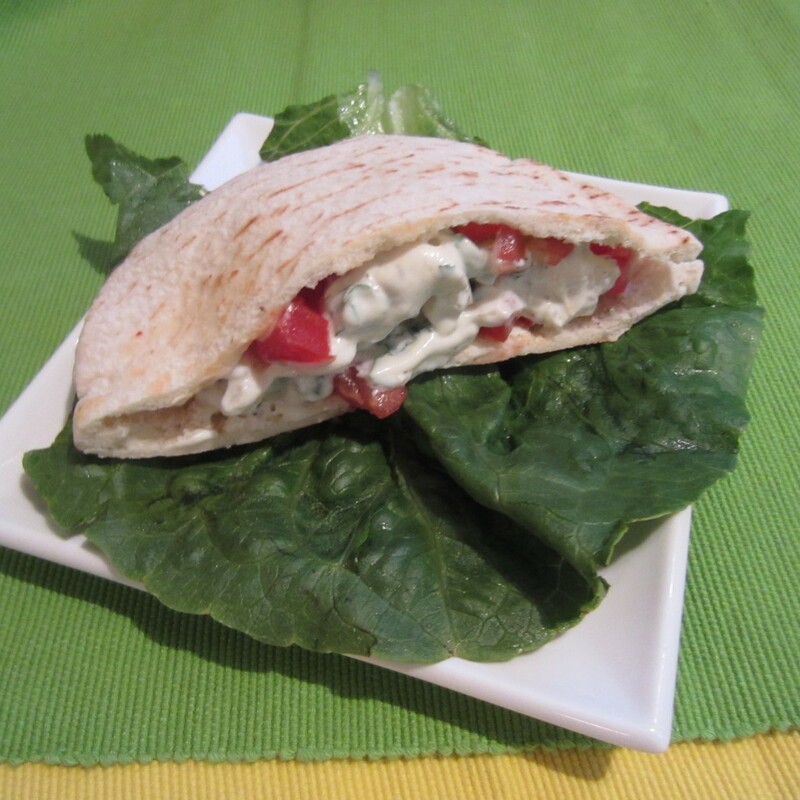 Calories are in the neighborhood of 375 for a full sandwich (two pita halves). When you consider a traditional gyro filled with lamb meat is around 600 calories, this is definitely a better option. If you want to reduce calories even more, cut the olive oil and vinegar mixture in half. You will lose 50 calories per serving. 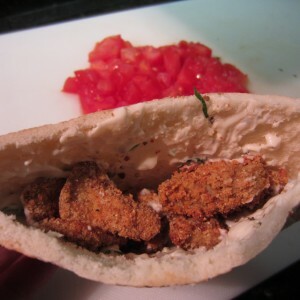 Stuff pita pocket with the roasted eggplant. 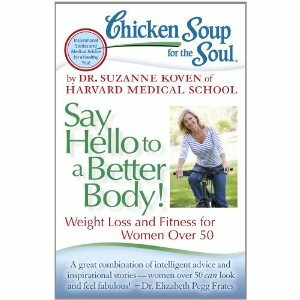 This new Chicken Soup for the Soul book is being released May 22, 2012. It is available for pre-order on the Amazon.com web site and includes a personal story from Blimpy Girl entitled the The Closet Witch. It is a short story of my post menopause weight loss journey and what started the Blimpy Girl blog site. If you find yourself battling weight issues in the post fifty years, I encourage you to order a copy. In NO less than 200 words, explain how you are working to overcome weight issues. Your age is not a factor. I am interested in sharing a story on my BlimpyGirl.com blog that inspires, encourages and motivates others to work toward a healthier and more fit lifestyle. Include your full name, shipping address and email. I will select the winning submission on May 24, 2012. This is an opportunity to share your personal weight gain struggles. In doing so, you may help motivate and encourage others to pursue a more fit way of life.